Les Ferdinand pauses, takes a sip of coffee and then offers the name of the Queen’s Park Rangers player who has proved to be irreplaceable. ‚ÄúRichard Langley,‚Äù said the man whose task now is to re-shape Rangers back into the kind of club where he made his name – along with the likes of Gerry Francis, Dave Clement, Ian Gillard and the Allen brothers Bradley and Clive. Richard Langley? ‚ÄúI will tell you why he is important,‚Äù said Ferdinand, now the Director of Football Operations at Loftus Road. Langley, now 35 and last seen playing for Staines Town, will hardly go down in the Hall of Fame at Shepherd’s Bush. 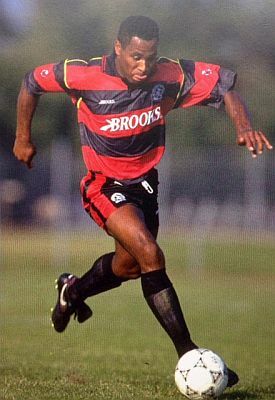 He had a decent enough career at Loftus Road playing 166 games and scoring 21 goals from midfield. He also played 17 times for Jamaica. But to Ferdinand, he is a hugely important figure. ‚ÄúAnd you look at players like the late Alan McDonald, Andy Impey and Wayne Fereday who came through the youth system. We have to get back to that.‚Äù In more recent years, the club’s philosophy had changed. Ferdinand was originally brought in as Head of Football Operations last October by owner Tony Fernandes – a fan of Ferdinand from the days when ‘Sir Les’ was the star turn at Loftus Road and Fernandes, as a student, lived on the Uxbridge Road. He wanted to see the man he idolised brought back, and had seen Ferdinand running a hugely successful development squad with Tim Sherwood at Tottenham until last summer. Ferdinand made it clear that he did not want to usurp the authority of manager Harry Redknapp. ‚ÄúI wasn’t coming in ahead of him, I was coming to work with him.‚Äù But the start of the pair’s working relationship was not the best. There was a recent home game, however, Ferdinand may now wish he had missed. And there was an incident which belied his laidback image. He was less than impressed with the performance of referee Craig Pawson in the 2-1 home defeat by Tottenham and let the official know in no uncertain terms what he thought. That has just cost him ¬£12,000 in a fine from the FA. That defeat added to the problems for a team with a wage bill that Ferdinand described as ‚Äúastonishing‚Äù. ‚ÄúTim Sherwood – a good friend of mine – was of course discussed but Aston Villa got there first.‚Äù It was decided Chris Ramsey would work with the players. Ferdinand said: ‚ÄúThe feedback the owners got was good so he is in charge until the end of the season.‚Äù But can Rangers survive? ‚ÄúYes,‚Äù said Ferdinand, with no hesitation.